These functions create very generic vector/scalar plots. See the "vectors" examples page for more customized vector plots. 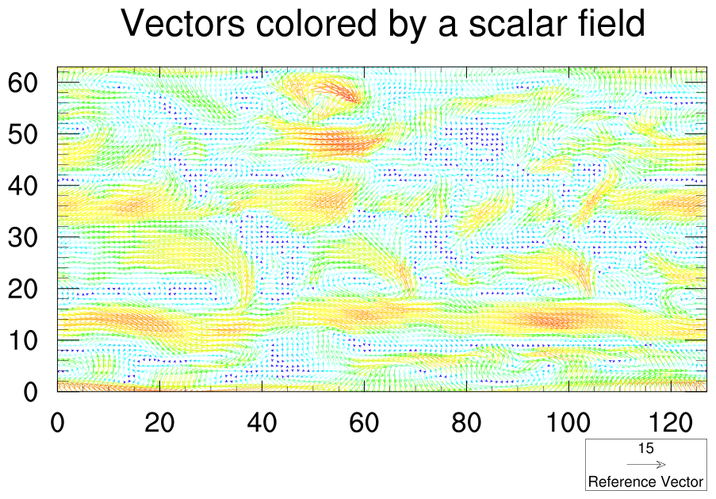 gsn_vec_scal_1.ncl: Vectors colored by a scalar field. 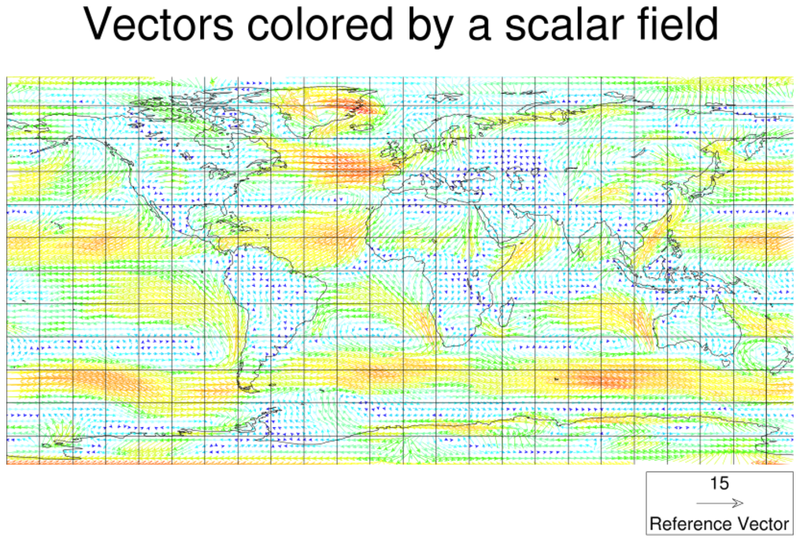 gsn_vector_scalar is the generic plot interface that creates vector scalar plots. vcRefMagnitudeF = 15.0, Defines the reference vector magnitude. Use this to adjust the size of the vectors. vcRefLengthF = 0.045, Defines the length of the reference vectors. gsn_vec_scal_2.ncl: Creates a contour plot and a separate vector plot and then overlays them. gsn_vector is the generic plot interface that creates vector plots. 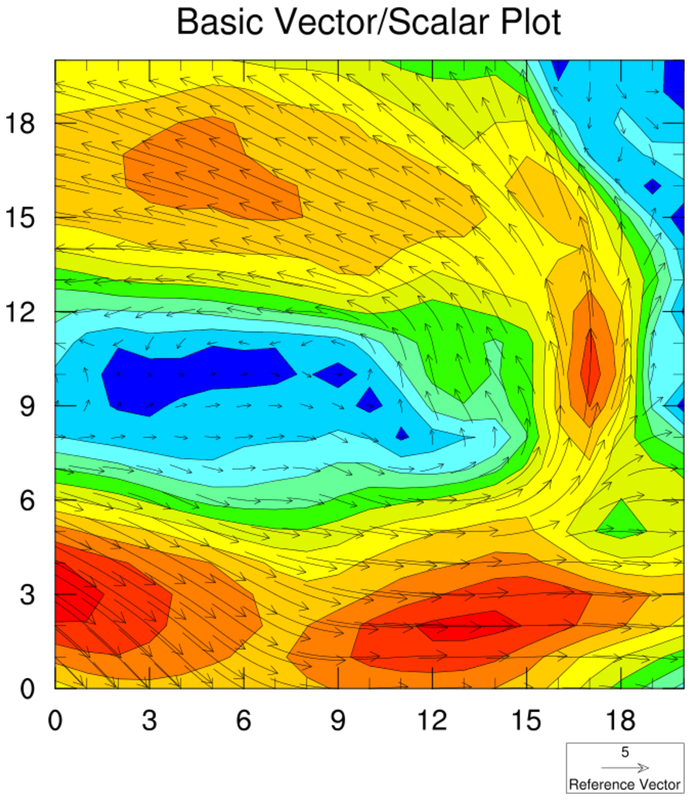 gsn_contour is the generic plot interface that creates contour plots. See gsn_contour_3.ncl for how to add a colorbar to this plot. gsn_vec_scal_3.ncl: Vectors colored by a scalar field and overlaid on a map. gsn_vector_scalar_map is the generic plot interface that creates vector plots over the cylindrical equidistant map projection..